Mark your calendars now and save the date for Downtown in December, the kick-off event for the holiday season. On Saturday, December 1, 2018, the city of Coral Springs will celebrate the holidays with food, fun, train rides, Santa, and more. What makes Downtown in December so special? It is a wonderful way to celebrate the holiday festivities early with all your friends. The weather report calls for snowfall on the great lawn, so make certain to bring some warm clothes and gloves – even if the temperature is in the 80s. Along with Broward Health Coral Springs and Bluestream, the city of Coral Springs will host the festivities at the City Hall Great Lawn from 5 pm to 9 pm. The City Hall address is 9500 West Sample Road, and parking in the City Hall garage is free. Bring your blankets and lawn chairs so settle in and watch the movie Polar Express. There will be a variety of food trucks and refreshments for purchase. You can take a free train ride around City Hall, enjoy a visit from Santa, and watch the formal tree lighting. Of course, what is a holiday celebration without cookies and milk, so bring your appetite. Help make the season special for those in need by bringing an unwrapped new toy to either the police and fire booth. 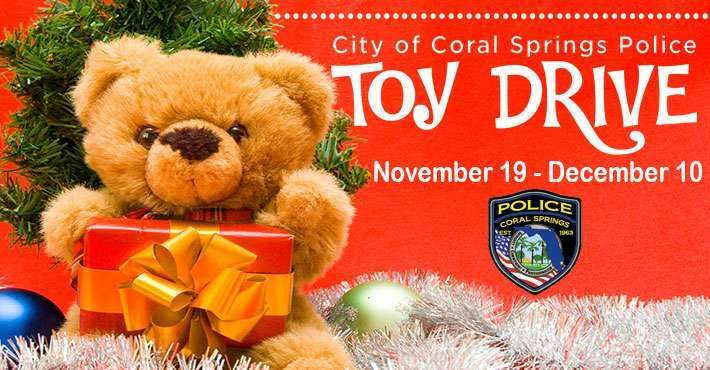 When you donate a new toy, you will receive a special Coral Springs holiday ornament. Themed toys for boys and girls – Barbies, action figures, Legos, Trolls, Star Wars, etc. Sports Equipment – footballs, basketballs, soccer balls, etc. All toys must be new and unused – No stuffed animals! For more information visit CoralSprings.org/events or phone (954) 344-1111.